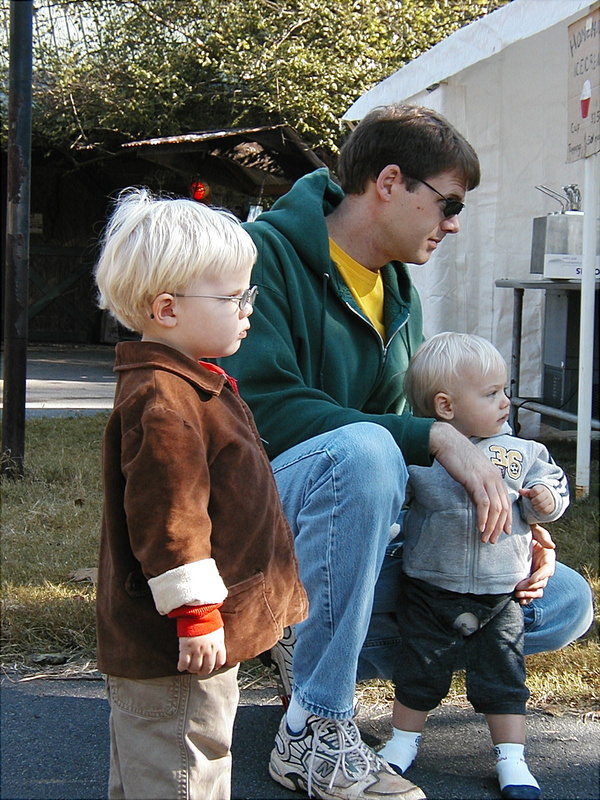 Every October since 2007, we have loaded up our family and headed to the local farm. During the month of October, Berry Patch Farms is open to the public. 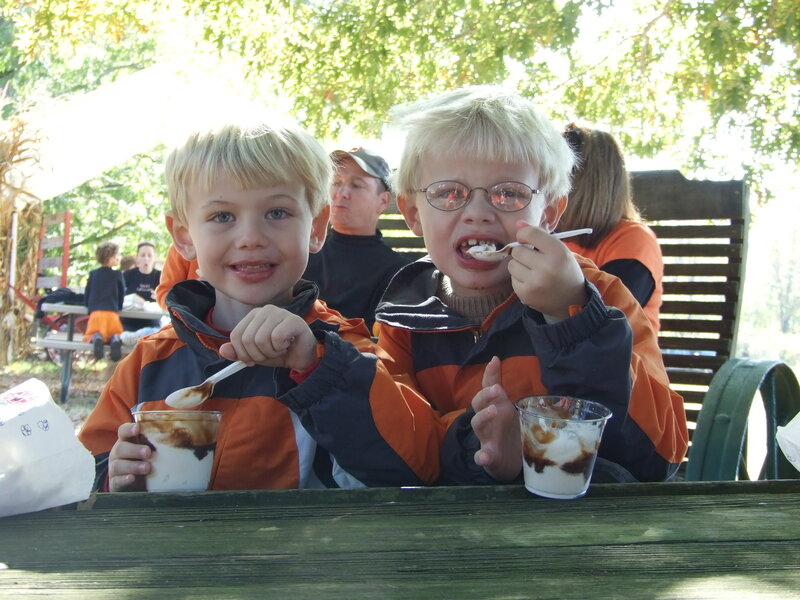 Families can enjoy the pumpkin patch, farm animals, face painting, horse rides and ice cream. Our boys look forward to visiting Berry Patch Farms at least once in October. With every visit, we stop to listen and to watch Old Faithful, the John Deere ice cream churner. The motor spits, sputters and spurts, repetitively. Sometimes, the kids and I dance a jig to the sound of the chugging churner, keeping the beat with the spits and the sputters. Nothing runs like a John Deere, and nothing makes ice cream better than a John Deere ice cream churner. Thanks for entertaining us again, Old Faithful. We look forward to October 2012, dancing a jig and enjoying the fruits of Old Faithful’s labor. Very cute boys, all three of them. A John Deere ice cream churner…how cool is that? Idea: Do you have a “live steamers” park near you? We have HALS, Houston Area Live Steamers where elderly gentlemen take us on a 10 minute ride on their handmade trains. My daughter found a similar park in Orange Country that our grandson loves. Maybe there’s one near you. I bet the boys would love that too. Thank you for the link, Georgette. I’ve pulled up the site and bookmarked it. I think we would all like to take a ride on those trains. We did a train ride when they were younger, and they loved it. We’ll have to do it again. Store these wonderful memories up for when they have grown and want to do other things, with other kids instead of being with the family all the time! I am storing these moments for certain, Judith. I wrote this post this year, because I don’t know how many more visits to Berry Patch Farms will take place. As the boys get older, I suspect their interest will pass. I will create a book of every BPF trip to remind them of the fun they had when they were little. (Here’s hoping they still want to go back next year!) Thank you for visiting and commenting. it’s nice to have traditions..Your boys are adorable! Thanks, Fraha. Traditions are definitely a nice thing to have. I am thankful for our October tradition. Thanks for the kind word about my boys, too. Good to ‘see’ you again. It isn’t even 7am and I’m thinking ice cream. That’s not bad, I could be thinking about a weeks worth of stuff in my in box. Better to eat your dessert first, Oma, even when it is 7am. When ice cream is an option… the work can ALWAYS wait. Peter there is something extra yummy about homemade ice cream. Yes, the ice cream did taste good. We are grateful to have this farm park so close to home. Thank you for visiting and leaving a note. I hope you had a nice weekend. This is a great time of year, isn’t it? Cool temps, beautiful colors and none of the hustle and bustle that arrives with the two upcoming holidays. Yep, I like Fall. (Spring, too.) Glad you and the kids liked the video. Those two budding writers are adorable! It’s been ages since I heard an old John Deere engine. That’s a grand memory from childhood. Thank you, Soul Dipper. I am glad I have the moment captured on ‘film’. The sound will definitely trigger wonderful memories in the future. I am glad it triggered memories from your childhood. It’s a good thing that you haven’t chosen this week to cut back on eating ice cream. Sounds like you all had a great time and I hope you get to go back next year too! Thank you, Jacquelin. We did have a great time. Thanks for visiting. My nose knows. (smile) Thanks for visiting, MJ! This is beautiful! The chugging of Old Faithful is splendid! Ooh, would I dance a jig, too! And the fruits of its labour — the last picture says it all! Thank you for this post, Lenore. And the smile it’s given me. I’m pleased to know two things, Priya …. 1.) That you would most certainly do a jig and 2.) than this post put a smile on your face. Mission accomplished. Is there anything John Deere can’t do? I’ve asked a Magic 8 Ball the same question more than once. Each time the response is, “My sources say no”. What adorable little guys you have! So cute. I just played the tractor video for my kids and they loved it. 🙂 When you said you were dancing to the sounds of the motor, I thought, really? But now that I heard it I get it! You’re right. Quite catchy. I am glad you let your kids listen and they enjoyed it. The fact that you know understand the catchy tune of the ice cream churner is even better! Come back often to do the jig! Wow…so that’s what regular families do, huh? Cool, Lennie…really cool…right now MY eldest is having a massive fit because Party City doesn’t carry a Captain America costume in his size. And yes, HAD I known, and HAD I grown two extra arms, I could have pulled something together. Alas, again, I fall short. Seriously? Did you just put me in a class with ‘regular’ families? Man, am I ever honored. I’m not sure anyone has every classified us as regular. Cool beans! Sounds like a great time, and ice cream, too? Perfect. The ice cream was the icing on the … well, you get the idea. 🙂 Thanks for visiting, Patti! Visiting Old Faithful really is one of those rituals we look forward to every year – so yes …. this family time most definitely rules!